(Papal Prophecy of Venerable Bernard de Bustis, 15th c.): "...near the time of the Antichrist, will come... a most violent conflict with the Roman Church such that there will be great tribulations. At this time, a schism will be produced in the bosom of the Church on the occasion of the election of the pope... there is one who will be called the true pope, but he will not be truly so. He will persecute the true pope and all those who obey him, so that the majority will declare themselves for the antipope rather than for the true pope. But this antipope will have a sad end, and the true one will REMAIN the unique and uncontested pontiff. ..."
*In 1857, Franzelin was appointed professor of dogmatic theology, at the Collegio Romano, a position he kept until 1876. 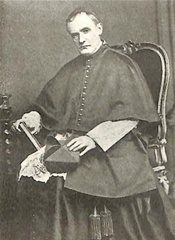 Named consultor of the Sacred Congregation of Extraordinary Ecclesiastical Affairs on April 23, 1869, he served as papal theologian in the First Vatican Council and made a considerable contribution to the drafting of the constitution "De Fide Catholica". Consultor of the Sacred Congregations of Propaganda Fide, Tridentine Council, Extraordinary Ecclesiastical Affairs and 'qualificatore' of the Holy Office. Created cardinal on April 3, 1876 by Pope Pius IX, the latter appointed him prefect of the Sacred Congregation of Indulgences and Relics on March 28, 1885. His theological works are known throughout the Church for their solidity, erudition and scrupulpous accuracy. Here's a passage from Cardinal Franzelin that discusses "the doubtful pope axiom". Short version: once a man has become a true pope, no doubt on the part of the Church can deprive him of the pontificate. If the whole Church were to doubt the legitimacy of a papal claimant, this would be a certain sign that he was never a true and legitimate pontiff. Scholion. It seems opportune in this place to very briefly set forth our opinion on the manner in which the extinction of this most calamitous schism and restoration of the full unity of the Church, or rather of the actual communion of all Catholics with the legitimate heir to the Apostolic See, should in our view be explained. For granting that all theologians and indeed the whole Church entirely agree as to the fact itself of the extinction of the schism by the legitimate and undoubted election of Martin V as the one true successor of Peter, nevertheless there is no such consensus, and indeed there exists no small difference of opinion among theologians and interpreters of the law, when there is question of the manner in which this happy outcome was legitimately arrived at. Especially now, after the lucid and explicit definitions of the Vatican Council on the divine rights of the primacy and on the relations that exist between it and the whole rest of the Church, for a more certain and firm treatment of the proposed question the dogmatic principles should be kept in view, which are contained in these very definitions of the Council or necessarily follow from them. 1º. As by divine law the primacy is established in Peter to be propagated in each one of his legitimate successors, for however long the Church built upon this rock continues standing; the legitimate election to the Roman Pontificate is merely a condition, which being fulfilled, the one elected thus enters into the series of successors of Peter, and by this fact receives the whole divinely instituted power of primacy not from the electors, who do not have it, but by force of the institution of Christ and from Christ the institutor, as being a rock by a participatory power from Christ who is a rock by his own native power. 2º. To the one established as Pontiff, the Church both in her individual pastors and flocks and sheep, and likewise viewed as a whole with all pastors and flocks and sheep taken together, is subject as one flock to one supreme pastor: not that the Church even taken all together has any power of jurisdiction over the supreme pastor himself, but he has the plenitude of power over her, as over his flock, according to the divinely established norms. Thus no power exists in the Church, which, once a Pontiff has been constituted, could diminish or take away the supreme power divinely conferred with all its rights. The power established by Christ and bestowed upon the successor of Peter, cannot cease in him except either (1) by spontaneous renunciation, the validity of which is quite certain after the definition of St. Celestine V on account of doctrines and deeds that are notorious in the universal Church, or (2) by spontaneous defection from the Church by manifest and contumacious heresy. Whether such a scandal could occur in him, who as pastor and doctor of the Church by the promise and institution of Christ cannot formally err in his definitions, and even as a private person has never done such a thing, not without reason is doubted by theologians, considering the sweet providence of Christ for His Church and the divine promises themselves (cf. Bellarmin. de Rom. Pontif. l. IV. cc. 6. 7.). 4º. Neither into formal heresy nor into material heresy, by positively denying what is revealed, or by affirming as revealed what is not revealed, can fall the whole Church, the kingdom of truth, by the promise of the Spirit of truth remaining in her for eternity; by the same reasoning from the promise of perennial unity, whose center and visible bond is the Roman Pontiff, the whole Church, the body of Christ, can never be separated from a true and legitimate Roman Pontiff, its visible head, neither by a formal nor by a material schism. If at some time such a secession of the whole Church may appear to have happened, as in the last years of Peter de Luna who was called Benedict XIII, this is not a defection from the true and legitimate Pontiff, depriving him of his power, which is impossible (n. 3. ); but it is a certain sign that he has never been a true and legitimate Pontiff. Therefore what is said by many to explain the acts of the gatherings at Pisa and at Constance in the form of an axiom: A doubtful pope is no pope, is only true if there is doubt and on account of the doubt there is a secession of the whole Church; but it cannot be admitted, if after a Pontiff is legitimately constituted, in a part or even in the greater part of the Church doubts and secessions arise on account of disturbances that have been introduced. 5º. When a part of the Church, without its own fault, on account of obscurity introduced into things, by a material schism adheres to someone as a legitimate Roman Pontiff, some of its jurisdictional acts, especially those that concern the internal forum, can acquire validity by a colored title; but neither by it, nor by any power, even legitimate, of an inferior, can the laws established by a true Roman Pontiff be validly abrogated or changed, especially those that determine the validity of acts related to the visible foundation itself of the Church, as is the election of the head of the Church (n. 2.). These principles being stated, we cannot understand how one could admit either the opinion of those who in explaining the acts of [the Council of] Constance say with Bellarmine and Suarez that the right of all three, who at that time claimed the pontificate for themselves, was doubtful because the individual obediences, as the parts adhering to diverse Pontiffs were called, regarded two of them as illegitimate; however, such a doubtful Pontiff is not a true Pontiff, or as we heard Suarez saying: “it could be that none of them had been a certain Pontiff and thus not a Pontiff [at all], because none of them had yet been received by the sufficient consent of the Church.” But he who is legitimately elected, by that fact is constituted a true Pontiff not by the Church but by Christ Himself (n. 1. ), nor is the “sufficient consent” of the Church required or to be waited for as a condition, that he be a true Pontiff; but “sufficient consent” by the prayer and promise of Christ for the unity of his Church certainly follows on account of the obedience that is owed, because he is a true Pontiff (n. 4.). Furthermore, it is evident that at Constance, as regards the manner of election and the legitimate electors themselves, many things were declared and done, that were aside from and against the laws for the valid election established by the supreme power of the Roman Pontiffs Alexander III, Gregory X, and Clement V. But such a change and suspension of laws of the supreme power could not be made except by the same supreme power of the Roman Pontiff, as follows from the divinely constituted relation itself of subjection of the whole Church beneath the power of the supreme Pastor, as we see that even Suarez admits: “because an inferior power cannot change what has been established by a superior, and because to Peter alone the primacy has been given for himself and his successors, to him alone or to the supreme Pontiff belongs... to prescribe the manner of his election and succession” (see above th. XII. n. III.). Now indeed if at that time there was no true Pontiff, because (as these theologians say) none was undoubted and certain, it is manifest that the inferior power of the congregation in Constance would have acted against the manner of election prescribed by the supreme power of the Supreme Pontiffs. Nor was only the manner prescribed for the election changed by admitting as electors besides Cardinals also other Bishops and simple priests, who indeed did not belong to the Clergy of the Roman Church; but difficulties existed with regard to even the Cardinals themselves taken from the three obediences, which [difficulties] I do not see solved nor indeed mentioned by these theologians, nor likewise do I see how under their hypothesis they could be solved. For if for about forty years (27 March 1378, when Gregory XI died, until the election of Martin V on 11 November 1417) nobody is said to have been a true Pontiff, how could all these Cardinals who were created by these pseudo-pontiffs be regarded as legitimate, who nevertheless, although taken from diverse obediences and from contrary pontiffs, recognized each other as legitimate in the Gatherings of Pisa and Constance, and contradicting the pontiffs themselves, by whom they were created, claimed for themselves all the rights of Cardinals? Further, if the election of Urban VI (8 April 1378) was invalid, why was the other not valid, of Clement VII (20 September 1378)? If however, which cannot now be justly called into doubt, Urban was truly created and by those very Cardinals, who afterwards defected, by public acts and written letters was acknowledged as the legitimate successor of St. Peter at least until the month of June, how by [their] subsequent secession and by the doubt thenceforth by wicked arts gradually propagated to many did he fall from the pontificate, who held it as bestowed not by the Cardinals nor by the Church but immediately from Christ God? Therefore, if he could not be despoiled of the divinely bestowed pontificate by any acts of man whatsoever, but until his death (15 October 1389 in his Roman see) remained the true successor of Peter, doubtless his successors elected according to all the established laws, Boniface IX, Innocent VII, and Gregory XII, were true and legitimate successors in the see of Peter. For those doubts which by the offending Cardinals were brought in and propagated after the election and acknowledgment of Urban had been established, and which they thenceforth extended to his successors, could only suffice, as we said above, so that those attached to the factions of Robert of Geneva (Clement VII) and of his successor Peter de Luna (Benedict XIII) or thereafter of Alexander V elected at Pisa (26 June 1409) and of his successor John XXIII, were not formally but only materially schismatics, and thus there could be found among them even holy men; but neither these doubts, nor what followed from them in the gathering at Pisa by the election even of a third, who assumed the name of Roman Pontiff, could take away from Urban VI and from his validly elected successors the dignity and power over the universal Church. The accusation of schism and of “notorious heresies” brought in by Pisa against Gregory XII, that as a promoter and defender of an inveterate schism he denied the revealed truth of the unity of the Church, and therefore had fallen from the pontificate, involves a contradiction; for if he was the true Pontiff having from Christ the supreme power over the universal Church, then by defending this his power against adversaries who were at least materially schismatics he did not attack in fact, much less did he deny the doctrine of the unity of the Church instituted by Christ chiefly in its head and beneath its visible head. Nor afterwards did Constance itself ever acknowledge “these notorious heresies” of Gregory or the truth of the judgment of Pisa, as will soon be clear. For it is not therefore necessary to deny that Gregory was obligated to freely renounce [the Pontificate] in that disturbance of the Church and that he could have sinned in resisting this obligation; but the assertion that the Pontiff is deprived of his power on account of sins other than heresies is condemned in article 8 of Wycliffe and in articles 12, 13, 20, 22, and 24 of John Hus as defined by Martin V in the same Council of Constance.